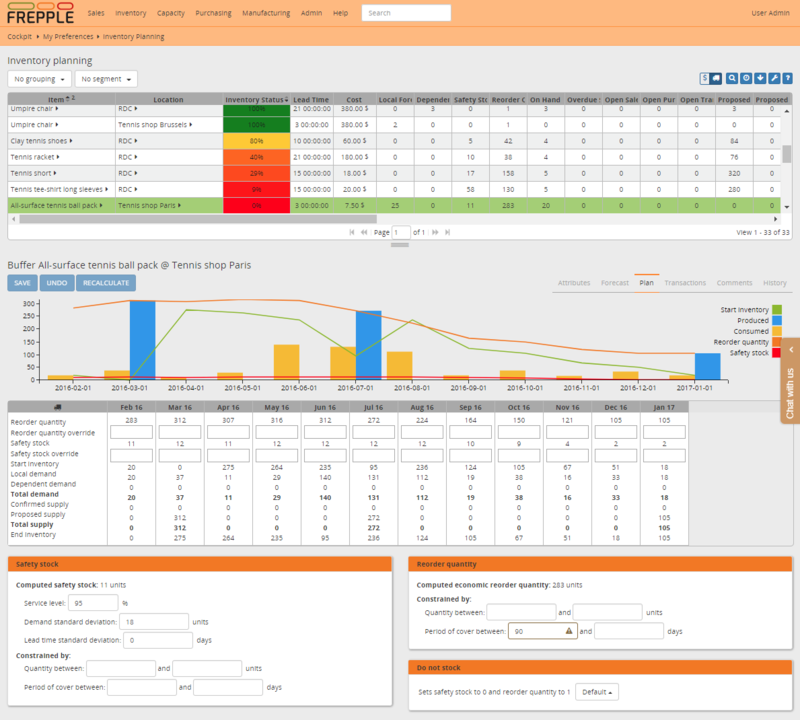 The inventory planning screen allows the management of the inventory policies at the decoupling points in the supply chain. 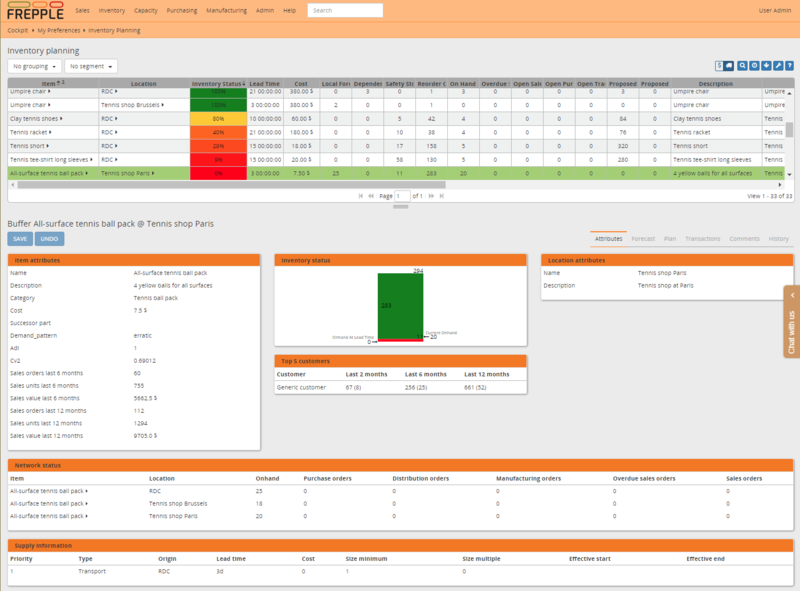 The top section of the screen allows to filter and sort item-locations according to planning metrics and various attributes. Item-locations requiring attention are easily found. The results can be shown in units or in monetary value, and in different time buckets (ie weeks, months, quarters or years). The bottom part has different tabs for different planning aspects. Whenever a parameter is changed, you can hit the recalculate button to see the impact on the plan. Item attributes, including its cost, category, demand pattern and the sales metrics over the last 6 and 12 months. Top 5 customers of the item at this location. Details on the inventory status. A bar chart shows the safety stock plus the replenishment quantity, with two indicators to compare the inventory with this expected range. The arrow on the right shows today’s current stock level. The arrow on the left shows the expected stock level one lead time from today. The lowest of both inventory positions is used to compute the inventory status of the item-location. Overview of the inventory and activity within the lead time of this at other locations in the network. This also includes the status of successor and predecessor parts. Summary of the replenishment methods, their lead time and size constraints and effectivity. The replenishment method can refer to production operations, distribution warehouses to transport from or suppliers to buy from. A second tab shows the historical demand and the expected future forecast. The demand history in the past periods can be adjusted to remove exceptional demand outliers. Note that the adjustment is added to the actual history. The predicted forecast for the future periods can be adjusted if the planner has more information on the expected sales. Note the the manually entered forecast overrides the computed value completely. Below the forecast table, the planner can choose the forecast method for the item-location, and review the expected forecast error (evaluated using symmetric mean percentage error, aka SMAPE). After hitting the recompute button you can immediately see the updated forecast, inventory plan and replenishment transactions. 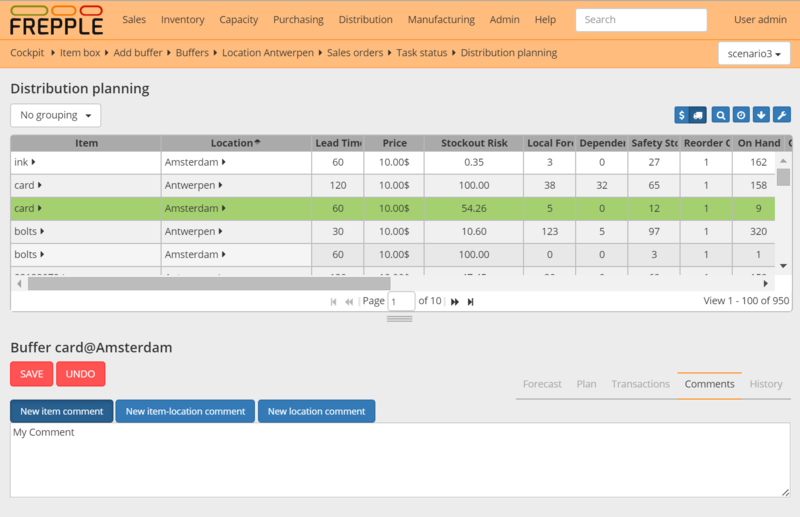 See the documentation of the inventory planning module to understand each parameter. 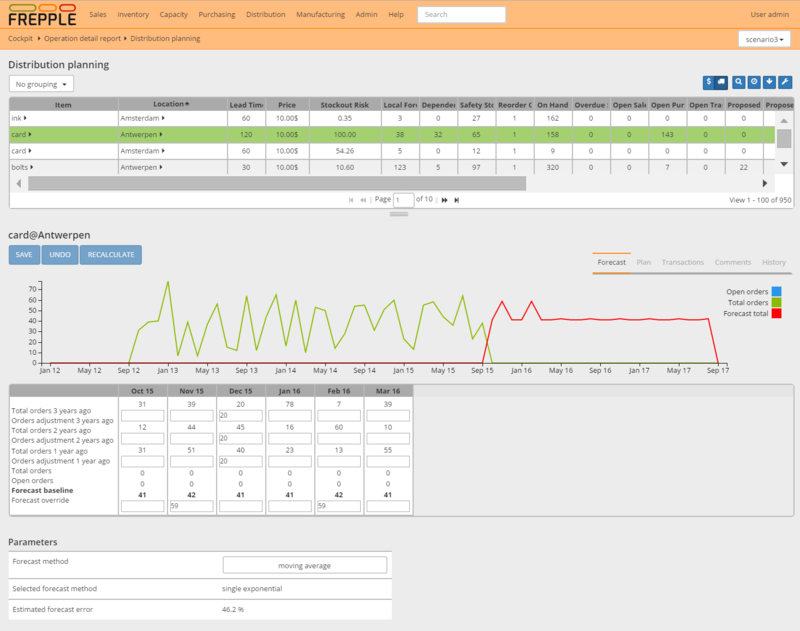 A third tab shows the planned inventory profile. Per period you can review the demand and supply. The reorder quantity and the safety stock are also displayed, and can be overridden in specific periods by the planner. Below the plan table, the parameters affecting the inventory plan are displayed. 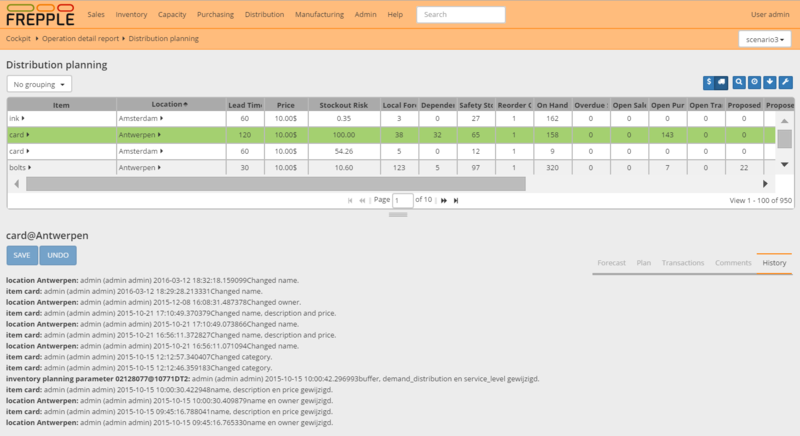 You can change the parameter values, and hit the recompute button to immediately see the updated inventory plan and replenishment transactions. When inventory planning parameters are highlighted with an exclamation triangle, it means that the value was set by a business rule. 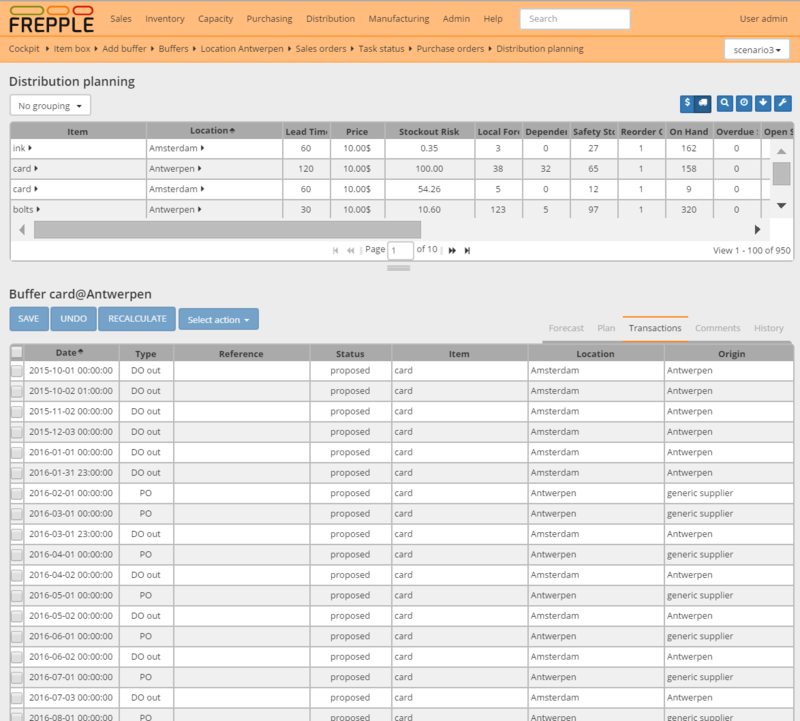 The fourth tab shows the planned and ongoing transactions that are currently ongoing or proposed by frePPLe. The list shows purchase orders, incoming distribution orders, outgoing distribution orders and open sales orders. Date, quantity, item and supplier can be edited for proposed transactions. When one or more rows are selected, the action list becomes active which is used to change the status of the transaction. If the Openbravo or Odoo connector app is activated, the dropdown allows the planner to immediately export the transaction immediately towards the ERP system. A next tab shows free-text comments on the item, location and item-location. New comments can be added. The last tab shows the editing history of the item, location and item-location.